"Uniform: Nurse Cape and Bag - 3" by Normadeane Armstrong Ph.D, A.N.P. 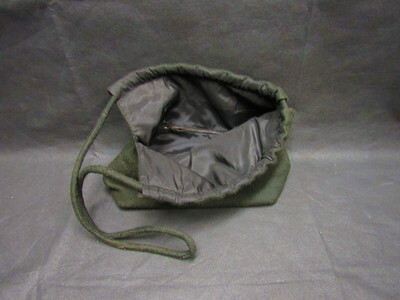 This is a dark green wool cape and bag with black silk lining. The cape has pull ties on the outside and shoulder straps inside the cape so it would not blow off the wearer. The bag has a draw string.